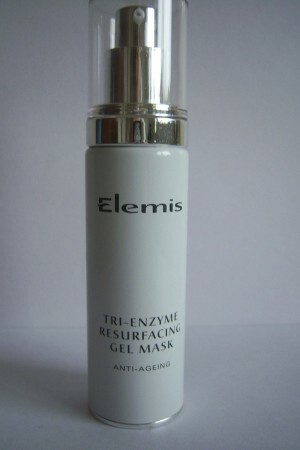 The Tri-Enzyme Resurfacing Gel Mask is one of my favorite products, and will soon be known as the Dynamic Resurfacing Gel Mask, as Elemis are currently rebranding its look and some of the names of their products. This is a quick acting mask that can restore troubled skin in a matter of days. The ingredients include Amazonian Acerola Cherry, White Truffle, Great Burdock, Erysiumum, and Amino Acids, which are used along with their patented Tri-Enzyme technology. This is quite an active product, so if you are particularly sensitive it’s best to try it on a patch on the neck first. It is an anti-aging treatment product (for the over 30s), but is also suitable for those who have a sluggish circulation, or need a rescue mask after neglecting the skin. It comes in a 50 ml pump dispenser, and you only need three to four pumps for an application. Once you have cleansed and exfoliated your skin, apply the mask very thinly to the face and massage in. You may experience a cool tingling, but it will only last a minute or two. This is because the ingredients are active. Leave for up to 10 minutes; it’s best used in the bath, and then rinse off thoroughly. The advice for most masks is to use it twice a week, but I find using it once a week is fine for maintenance purposes. As a treatment if you need a quick boost because your skin has been neglected, use it two to three times for a week, making sure there are a couple of days between each application. You will find you then only need to use it once a week. The best thing about this mask is that it is works very quickly. Your skin will feel smoother and softer straight away. It is an intensive treatment mask, and shouldn’t be used too often, as it can be too stimulating for the skin. Using it more than necessary may result in a skin reaction with the active ingredients. When the skin is over stimulated it produces more oil (sebum) than necessary and you may get a small break out of spots. It’s very concentrated and the product lasts a long time. The smell is pleasant and the texture is easy to apply. At £49.50 ($78.50) for 50 ml, it’s classed as premium skincare, but it is a worthwhile investment. It is more active than people imagine, so use once a week at first and see if your skin needs more. It’s not suitable for those with highly sensitive skins, or people that don’t like to feel their products working. Due to the packaging, it’s hard to tell when the product is empty, and you can’t open the container to get any last remnants out. This is a great mask for winter, when the skin gets dehydrated and people get the flu. Use it once a week to prevent dryness or dehydration from heating systems. Apply while in the bath; the steam will make the tingling less noticeable, and will help the skin absorb the mask faster. Always exfoliate before using the mask for maximum benefit; otherwise the mask has to penetrate dead skin cell layers before it can be active. Don’t leave the mask on too long—usually within 10 minutes the mask has been absorbed, but you must rinse off the residue because of the active ingredients. Rating 4.25/5: One of my favorite products to get my skin back to normal after traveling, or if I’ve been ill. This isn’t a relaxing product to use, but one to fix problems, and it does it quickly. I sometimes wonder when I can’t pump any more out, how much am I wasting, and that is my only complaint. Recommended if you need a mask to boost the skin circulation, or to smooth and soften the texture of the skin.